Diesel and biofuels gel at temperatures below freezing. Paraffin crystals form in the fuel, making it gelly-like and flaky. As these suspended flakes pass through the filter, they gum up its microporous surface. 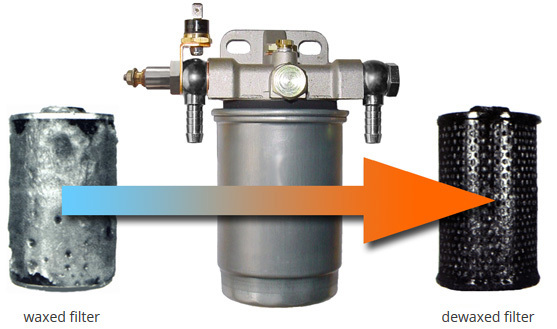 Within a short period of time, the fuel will no longer flow through the filter to the injection system. The result: the engine loses power and stops running. Adding gasoline or additives to prevent fuel gelling offers no real solution but only seem to help on a limited basis. They can have a negative effect on the engine´s performance and life cycle, not to mention, they must already be added before it turns cold. Also “Winter diesel” (formulated especially for winter usage) does not guarantee a smooth running engine. Winter diesel is laboratory tested to -20 °C. At lower temperatures and wind chill, it is unclear whether the engine will even run. In any case, the engine works unregularly, resulting in a increase of fuel consumption. To prevent the fuel filter from waxing, only the supply of warmth can avoid the problem. 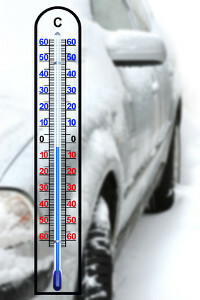 Heat ensures a smooth engine operation and prevents the increased consumption in winter. The DIESEL-THERM fuel heater is the effective and permanent solution to avoid cold problems with diesel and biofuels. DIESEL-THERM prevents the filter´s pores from clogging up even at extremely low temperatures by warming the fuel with a small heating system, which is mounted in front of the filter. Within a matter of seconds, the energy-rich paraffin crystals will dissolve and the fuel passes through the filter as if it would be summer. By controlled preheating of the fuel temperature-related operating problems will be effectively eliminated from the critical part of the fuel system and fuel additives are not required anymore. To prevent cold-flow problems or a loss of power due to a waxed fuel filter DIESEL-THERM is activated for the winter operation by a rotary switch. 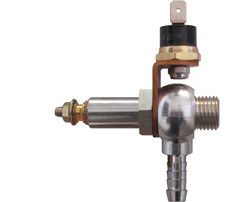 The heating process is displayed by a pilot lamp and automatically regulated by a thermostat. The screw/filter version DH is installed instead of the existing banjo screw (thread M14x1.5 or thread M16x1.5) at the filters entrance. Alternative thread sizes are available on request. 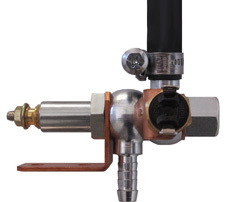 The universal version DHS is installed in the fuel line (flexible rubber hose) with 08, 10 or 13 mm inside diameter (ID) in front of the filters entrance. The universal version DHSE is installed in the fuel line (inflexible polyamide/metal pipe) with 08, 10 or 12 mm outside diameter (OD) in front of the filters entrance by means of Ermeto compression fittings. The company ATG has been active for more than 25 years in the field of fuel preheating. DIESEL-THERM is for example used by: BayWa, Deutz, Faun, Fuchs, Hitachi, Honda, Iveco Magirus, Kaessbohrer, Kramer, Liaz, Liebherr, MAN, Mitsubishi Motors, Nissan, Toyota, Zeppelin. Which DIESEL-THERM version fits to my vehicle? Due to the wide range of vehicles or engines on the market, it is almost impossible to make a type-specific statement. In any case, the type of the fuel pipe (rubber hose, polyamide, metal, …) and its diameter at the entrance of the fuel filter needs to be determined. In case of doubt, please do not hesitate to contact us. Where can I order DIESEL-THERM? 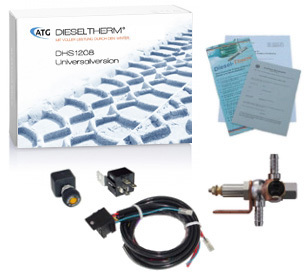 DIESEL-THERM is available directly from ATG or ATG partners. Where can I have DIESEL-THERM installed? The installation ca be performed by any reputable garage/mechanic. Craftmanship and an understanding of diesel engines provided, a DIY (do-it-yourself) installation with the included installation notes is also possible. Is the electrical preheating of fuel generally allowed? For your own protection, please check with the appropriate authorities in your country. This has also to be done for any changes on the vehicle. Is it possible to operate my vehicle with straight vegetable oil (SVO/PPO/WVO) after the installation of DIESEL-THERM? DIESEL-THERM is used for preheating diesel and biofuels to prevent cold-flow problems through clogged or waxed fuel filters. For heating-up straight vegetable oil to combustion relevant temperatures DIESEL-THERM alone is insufficient. To operate diesel vehicles and motors with straight vegetable oil (SVO/PPO/WVO) our Vegetable Oil Conversion Kits are necessary.